4. Who Should we Treat for Osteoporosis? 4. The Evaluation of the Patient for Osteoporosis- Using the Diagnostic Tests for Treatment Interventions. Get new insights into the causes, detection and therapy of osteoporosis and the osteoporosis of rheumatic diseases. In this state-of-the-art resource, you'll find coverage of all the latest scientific and clinical developments, new concepts in epidemiology, cutting-edge information on genetics and pathogenic mechanisms, current developments in diagnostic interventions and prevention, and the very latest techniques in treatment. 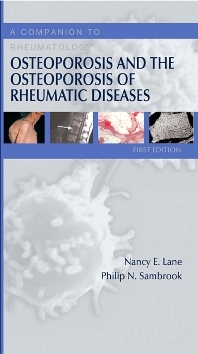 This is a must-have reference for comprehensive, one-stop coverage of Osteoporosis. Allows planning of early interventions, as appropriate, to augment peak adult bone mass. Highlights the necessary tools for early diagnosis, and monitoring of disease progression. Discusses the very latest in pharmacologic interventions, including biophosphonates, SERMS, and osteoanabolic agents. Provides access to the latest information on disease modifying or disease controlling biologic agents. Incorporates the latest on glucocorticoid and transplantation- induced osteoporosis, as well as osteoporosis in the rheumatic diseases.